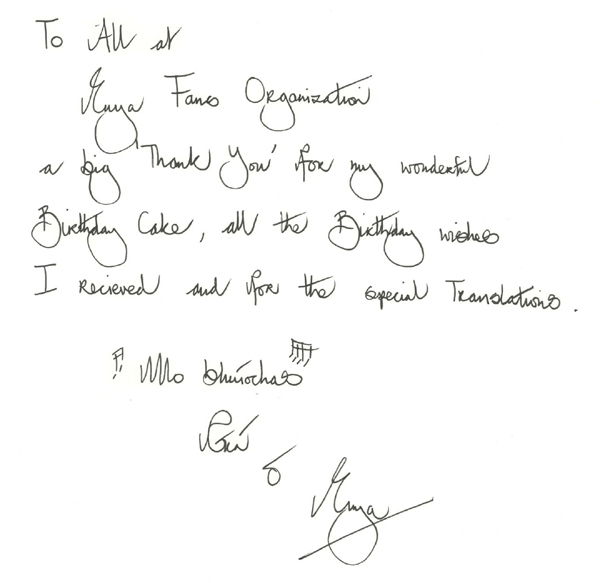 Having learned handwriting analysis for several months, I’m very lucky to get two samples of Enya handwriting from her fansites (thanks to enyafans.org and enya.sk). Handwriting analysis or graphology itself, in rough is a knowledge to reveal someone’s personality through his/her handwriting. This is because handwriting is a result from neuro-muscular work, and resulted from a part of the brain that controls behavior. Hence, the people’s state of mind and psychological characters will affect their handwriting. For some of you who think handwriting analysis is like tarot or palm reading, no, it’s not something like that. It’s a science and had been statistically tested. But the analysis accuracy of course, would depends on the analyst capabilities itself. Now if you see those samples, I bet what’s catchiest in your eyes is the flamboyant Y and G lower loops. That signifies a very huge physical drive, vivid fantasies, and a need for variety (isn’t this great for the music! :)). People with this inflated Y and G lower loops wants to live life to its fullest and has deep desires of physical things. The width of the loop signifies a vivid imagination. Sometimes, so vivid that the writer with this wide loop can be worrying or overconcerns to what seems to be trivial things. But what’s surprising is, this Y loop is opposite to “reclusive”. All the time, media boasts Enya as reclusive princess who’s hardly out of her castle or worse, “friendless and loveless”. The “reclusive” people (in social term) has a tight, small retraced Y loop that signifies a very socially selective and untrusting toward others. Apparently from this wide Y loop, Enya has a healthy social life. I noticed an early Enya signature in Watermark era, and she doesn’t change her Y lower loop. Other sign of lacking of trust is a narrow retraced e, that signifies a selective listener (in rough, a mindset “it’s not what he said, but who said it”). These two “reclusive” traits however, aren’t visible in her handwriting. Interestingly, Enya crosses her T-bars with slant upward. It signifies an ambitious, enthusiasm, high self-confidence, and great self image. This kind of writer is a go-getter. This healthy ego is also displayed from the big-sized capitals. Enya dotted her every i’s, signifies a self-discipline and attention to details. She consistently writes in an erect slant and small sized fonts. The erect slants indicates a head-rules-over-heart and self-reliant. The small size fonts are sign of high concentration ability, focus, and willingness to do a detailed job for a long time. It signifies an introvert tendency and low-profile too. In the job field, the small font writers feel more comfortable to work far from the spotlight, although they can be at-the-spotlight worker too. No wonder Enya is publicity shy. I noticed that in Watermark era, Enya had an even smaller sized signature than now. Meaning, she’s more spotlight shy during that time. Now the way Enya writes her sentences in a wide spacing. Wide spacing screams loudly “I need my own space”. It indicates a need for privacy, as well as generosity. Now in this point you might ask “wait....you’ve already said Enya is not recluse, and now you say she needs privacy?”. I’ll ask you back : when you have a healthy social life, is it possible that some time in your life you need your own space? A me-time to do your own thing?”. If you answer “yes”, of course, it’s very possible and do-able. Enya is also an intelligent woman with a fast mind, shown from the sharp pointy hump of m and n (see word “my” for example). The trait of fast mind is also displayed from the way she puts the i dots mostly after the i stems. The upper loop of f letter she’s made stands for artistic creative and idealism. The ending strokes she consistently makes that slant upward (notice the high ending-stroke from letter “l” in “wonderful” for instance) signifies a desire for attention, without being flagrant about it. Judging from her handwriting, Enya is critic-proof. She’s not sensitive to criticism as she doesn’t loop her d stems. So, the haters and naysayers may say her music is boring, dull, or predictable in their power until their throats dry out, but she won’t likely to react. Now, the most interesting part is the beginning hook in f (such as “for”) and e (in “enya”). It shows acquisitive trait, or desire to acquire (a.k.a. shopaholic). But checking her whole handwriting, Enya puts her acquisitive hook only in f and e (her own name or signature), so I doubt if she has this trait in a great intensity. The words “Mo Bhuiochas” maybe what most attract my attention. The slashed i dot could presents a possible temper or an irritated feeling at the time of writing. However, I’m confused if Enya slashed her i dot because she harbors a temper at the time or it’s just for decorating purpose, seeing the “mo bhiuochas” part is put in the end of letter (The slashed in “Ryan” signature part is not counted). And she never slashed her i dots in other samples. Another sign of temper is the t-bars that mostly put in the right direction (see the t-bar in phrase “to participate” from the second AWC sample). The “M” in “mo”, the second hump is higher than the first, signifies a high self-awareness. Including in this is fear of being judged when doing a possibly failed action. Is this the real reason why it takes a long time for Enya to do her first concert and seldom sing live? Now it’s up to fans to speculate about that. The last part is the signature. Enya’s signature is identical with her handwriting body, signifies that she acts as she is. Meaning, the way she presents herself in public is no different with the way she presents herself in daily life. She doesn’t consciously try to look calm, graceful, or to create enigmatic image, it’s naturally in her attitude. Again, an underlined signature of her shows an inner-strength.